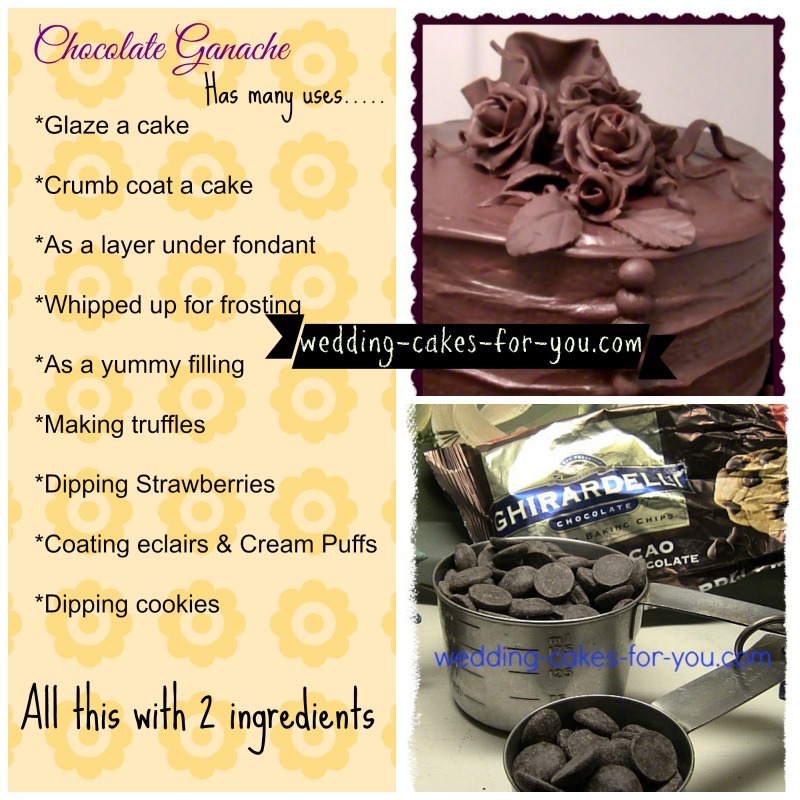 A superior chocolate ganache icing recipe is prepared with Ghirardelli chocolate. Use it for chocolate dipped strawberries, piping decorations, or as a filling and frosting for your favorite wedding cake recipe. 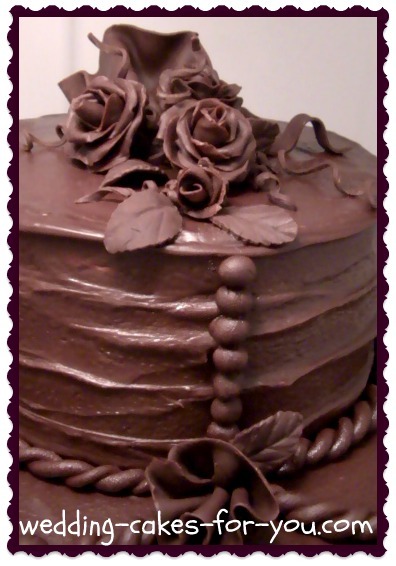 The roses and chocolate leaves in the photo below are made using a modeling paste, as are the round buttons and braided edges. You can also pipe flowers and shapes with ganache. This can be used as a glaze while still warm or as it cools down it becomes a wonderful rich filling or dark chocolate icing. Use it as a crumb coating also known as dirty icing. The reason it is called this is because the first layer that you put on your cakes acts as a crumb container. Sometimes the crumbs will get into this layer and make it appear "dirty"
ALternatives for crumb coating would be a thin layer of icing, frosting or in some cases fruit preserves or jams. (I have even used extra chocolate mousse for this purpose if the cake is chocolate. Cooled down, chocolate ganache icing can be shaped into balls and rolled into coconut or chopped nuts to make a delicious candy or while still warm use it as a dip for cookies, eclairs and fresh fruit. The recipe in the video is a variation of the recipe below. Join my Wedding Cakes For You Youtube Channel. You can half the recipe shown here for a smaller batch. The recipe here is enough to fill and frost generously a two layer 10 inch cake. In the top of a double boiler, over simmering water heat the cream. Add the chocolate and stir until melted. Finally add the corn syrup. In the top of a double boiler, over hot, but not simmering water, melt the chocolate and cream. Remove from the heat and stir in the butter. Bring the cream and butter to a boil and immediately pour them over the chocolate. Stir like crazy to make sure the chocolate does not burn before it is melted.